Thousands continued protesting in Algiers for an eighth successive Friday. They're still demanding the ruling elite step down ahead of a presidential election in July. Algerian police arrested 108 people after clashes with "infiltrators" that injured 27 policemen, they said in a statement. Ten days ago, President Abdelaziz Bouteflika resigned after spending 20 years in power. It came after weeks of demonstrations. Abdelkader Bensalah, head of the upper house of parliament, replaced the ailing 82-year-old as interim president until the election on July 4. But protestors chanted "No to Bensalah," and one banner read "We want the prosecution of all corrupt people". "We came out today to say that Bensalah's position is unconstitutional," said one protester. "The constitution needs to be protected. "It needs to be protected by implementing Articles 7 and 8 that say that the people have the authority, not the military, which brings in one of their own. We do not deserve military rule. We deserve a democratic and free Algeria." Another added: "I came here for my children. They do not deserve this. They do not deserve rule that doesn't love them." Algeria's army chief, Lieutenant-General Ahmed Gaed Salah said he would support a transition toward elections. 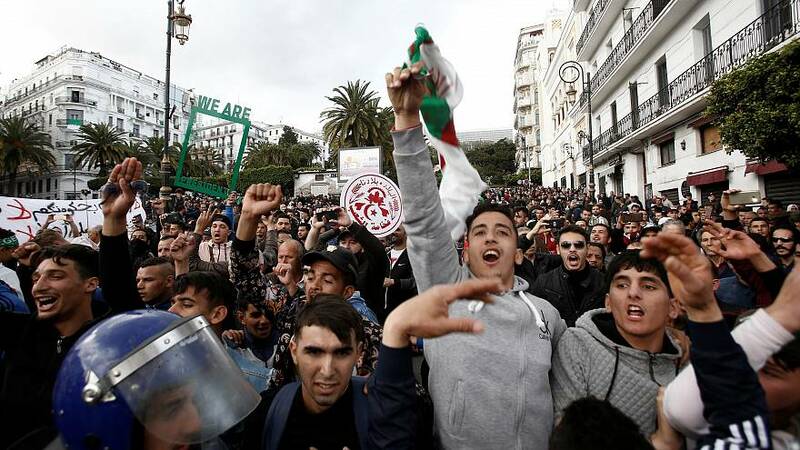 Algerians want a liberalised economy and jobs. One-in-four people under the age of 30 are unemployed. This age range makes up around 70% of the population.